The picturesque Kilchoman Distillery sits nestled amongst the traditional buildings of Rockside Farm on the north-west coast of Islay. Famous as Islay’s Farm Distillery, our barley fields stretch west, sheltered beneath the Cnoc Dubh cliffs, to the shores of Machir Bay and the Atlantic Ocean. 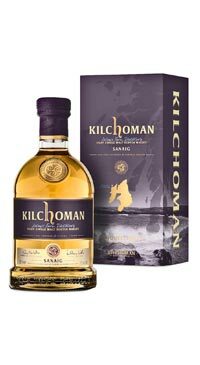 Kilchoman Distillery is unique in many ways, most notably for their 100% Islay range, Islay’s only Single Farm Single Malt – from barley to bottle. Sanaig, located north of the distillery is a small rocky inlet and is the name given to this predominantly sherry cask influenced expression. The colour is beech wood, with a nose of soft cooked fruits with caramel and vanilla. Toffee and peat smoke, citrus and a lingering sweetness. A lovely balance of peat smoke, citrus fruit and sweetness on the finish.